Businesses in the Lower Don Valley are backing plans to install multi-million pound flood defences in the area. The plans involve the construction of new flood walls, installation of flood gates and clearing and maintaining the River Don across an 8km stretch from the city centre to Blackburn Brook. Work will ensure an adequate standard of protection to businesses in the area against a minimum of a 1 in 100 year event. 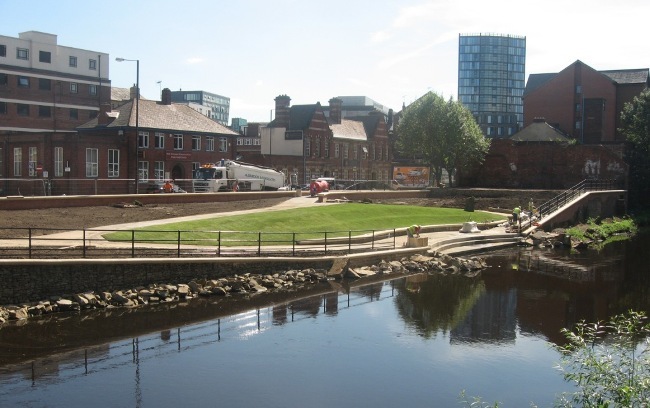 Sheffield Chamber is working to raise awareness of the plans, which require financial support from businesses within the designated at risk area around the River Don. They are working in partnership with Sheffield City Council which is leading on the technical feasibility, public funding applications and project management. A BID would see affected companies making a small percentage payment calculated on their rateable value over a period of five years. This has to be approved by a majority of businesses affected by the plans through a ballot, which is expected to take place in July. Businesses of all sizes are currently being consulted on the proposals and the BID with the Sheffield Chamber and City Council. So far, more than 40 businesses have attended a series of meetings at the Chamber about the scheme. Also, a steering group, made up of a dozen businesses across the Lower Don Valley, has been discussing defences for more than two years following the devastating floods in 2007. “Our considerable experience of flood risk engineering has convinced us there is no substitute for robust physical defences such as those which will be constructed under the project. “Flooding continues to pose a risk to businesses and infrastructure throughout the Lower Don Valley and is an obstacle in the way of the area meeting its full development potential. “The flood defence protect is a fantastic opportunity to deliver robust, valley wide protection against the majority of significant flooding events. The Lower Don Valley flood defences steering group meet on a regular basis to discuss the proposals with the Sheffield Chamber and City Council. Any business wishing to attend should email jenna.selwood@scci.org.uk.